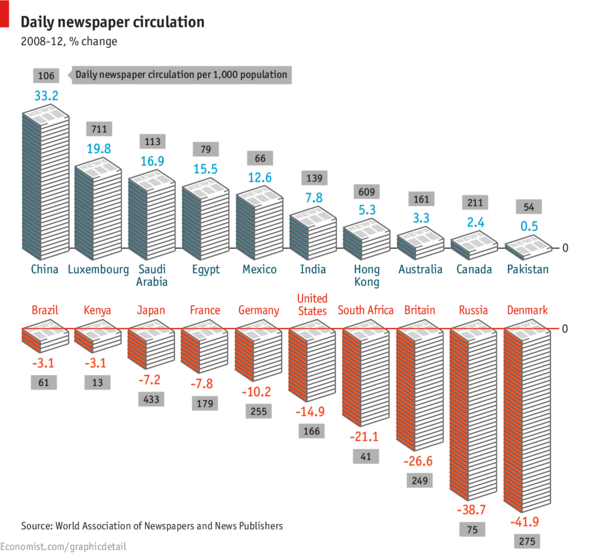 Journalists and print loyalists who are dejected about the state of the U.S. newspaper business may be comforted — or perhaps made a bit envious — by the knowledge that in at least some other countries, newspaper circulation continues to rise smartly. The chart below, from The Economist’s Graphic Detail blog, uses data from the World Press Trends database to show where circulation per 1,000 people has risen and fallen the most over the past four years. In its 2011 State of the News Media report, The Pew Research Center’s Project for Excellence in Journalism noted similar patterns and discussed several reasons why print readership is growing in some countries while tailing off in others. The most important growth factors, it seems, are rapidly rising literacy and disposable income combined with relatively low online penetration; those have created large numbers of new potential readers for whom print is still the most accessible news and information source. Other factors identified in the Pew Research report, which may be more or less at play in different countries, include political democratization, economic liberalization, government subsidies, and greater reliance on circulation revenue as opposed to advertising.